I received few tutorial requests from my readers that asked to me, how to design Facebook style friend request system using MySQL. I had posted few tutorials about twitter style friend follow and follower concept designs, Facebook friend system is involved with few pending steps such as sending a request and accepting a request. 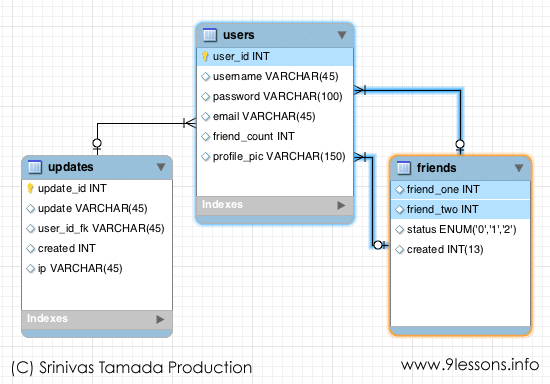 Here I have discussed how to design a database and implementation of SQL queries, hope this post will help you to understand the friend system. 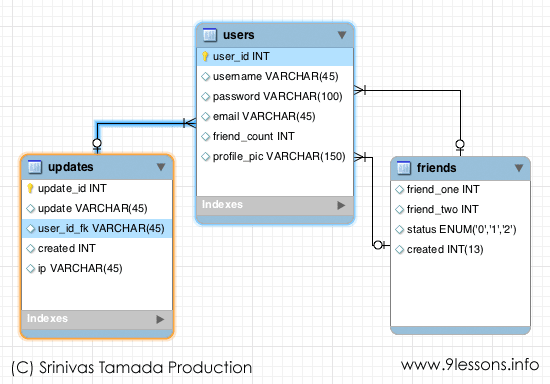 Previous Tutorials:Facebook Style Messaging System Database Design. To build the friend request system, you have to create three tables such as Users, Updates and Friends. Here status 0, 1 and 2 values references to Pending Friend Request, Confirm Friend Request and You. This statement is required for user registration, here status 2 represents to you. This helps while retrieving friend updates along with your updates. Use the following insert statement for adding a friend. Here friend_one represents the friend request owner. This contains simple PHP code, this helps you to display the proper friend request related buttons. Data relations between users, friends and updates tables for friend feed results. The following SQL statement users table object as U, updates table object as D and friends table object as F . Here $user_id reference to user session value and $friend_id is reference to friend user row id value. 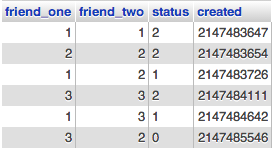 Data relations between users and friends tables for displaying user friends. Take a look at the following SQL statement users table object as U and friends table object as F . Here user_id is the login user session value. i could understand this in easy manner! What is your opinion of object oriented syntax versus procedural style in mysqli ? im always looking forwad to ur new Tuts, greate work mane!! !...just wondering if facebook wont hv a problem if they found out u giving tutorials to imitate their site.. Very nice information. Thank you so much for sharing. That awsome tutorial Bro. This is first post i read you blog. Really interesting, I always found you informative. Thanks for sharing such a great post. Keep blogging! best if come with demo. Thanks for sharing such an intellectual post!!! really nice coding!!! When "checking a friend", what if the current user has already confirmed the friend's request (i.e. the status has been set to 1), as it's written, wouldn't your logic errantly display the "confirm request" box? Regarding the sql for confirming a friend request, how could the user ever be in a position to confirm a friend request as friend_one? Your SQL suggest he could. Was that your intension to include your OWN updates in the "Friends Updates list", because isn't that what "F.status > '0'" would allow for? I'm thinking the app shouldn't allow for the same pair of friends to have multiple rows in the friends table, right? So, the following shouldn't be possible, But I didn't see where your script was checking for that when adding a new record. through make a relationship table with friends.. Thanks for the tutorial! Good job man. Thank you. but I got a doubt. As db grows bigger, this is really going to hit the performance right? 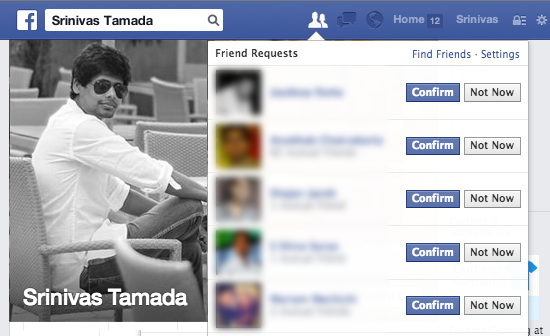 i am not understand why you using friend_one and friend_two if i got 10 friend request than what gonna do any idea? I'm stucked with update table.. I need help! This is an awesome tutorial! How would you go about getting a list of users for a person that are friends yet.? Please, how can i create the request button. I don't see where you include it in your tutorial. Please help! What is the meaning of YOU. ? very nice tutorial . I just want one thing to display recommended fiends like facebook . Friends from friends of friends like this . how to get mutual friends of a specific user with status. bro need video tutorial ! Sir, plz give me this frnd request script! Should friend_one and friend_two both be indexed for searches to be faster? How does facebook listen for newly made requests so they can update the client view without having to wait for the user to refresh the page? nice explanation. but need tutorial with example with values so that can understand easily. can you provide code for android using Mysql database? ?